Heat oven to 425°F. Place pie crust in 10-inch tart pan with removable bottom. Press in bottom and up side of pan. Trim edge if necessary. Prick with fork. Bake 9 to 11 minutes or until lightly browned. Cool on wire rack. Meanwhile, in 2-quart saucepan, mix sugar and cornstarch. In small bowl, mix cream of coconut, milk and egg yolks; gradually stir into sugar mixture. Cook over medium heat, stirring constantly, until mixture thickens and boils. Boil and stir 1 minute; remove from heat. Beat in butter and 2 tablespoons rum with wire whisk. Cool at room temperature 1 hour. Pour cooled pie filling into baked tart shell. 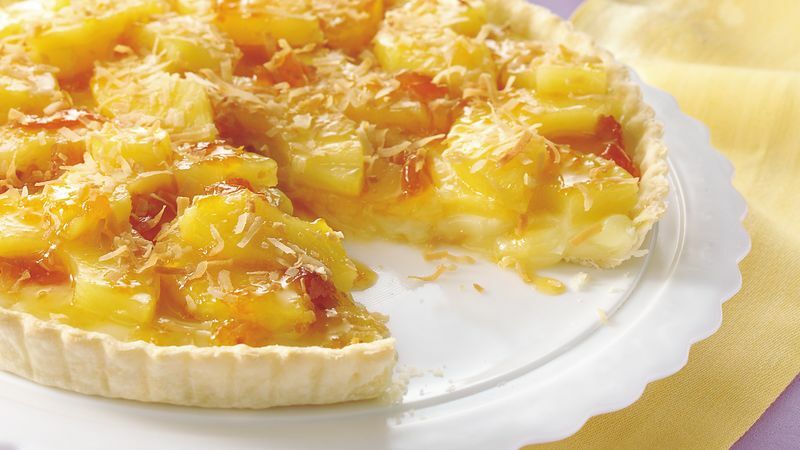 Arrange pineapple slices in decorative pattern over filling. In small microwavable bowl, microwave jam uncovered on High 20 seconds. Stir in 1 tablespoon rum; mix well with fork. Brush glaze over pineapple. Sprinkle with toasted coconut. Refrigerate until serving. *To toast coconut, bake uncovered in ungreased shallow pan in 350°F oven 5 to 7 minutes, stirring occasionally, until golden brown. Piña colada refers to a tropical drink made with cream of coconut, pineapple juice and rum. Cream of coconut is a canned mixture of coconut paste, water and sugar. It is available in supermarkets, usually near the soft drinks, and in liquor stores.